During the 5 days of savings receive a $500 trade in voucher or an additional one year to our Courtesy Care maintenance plan. 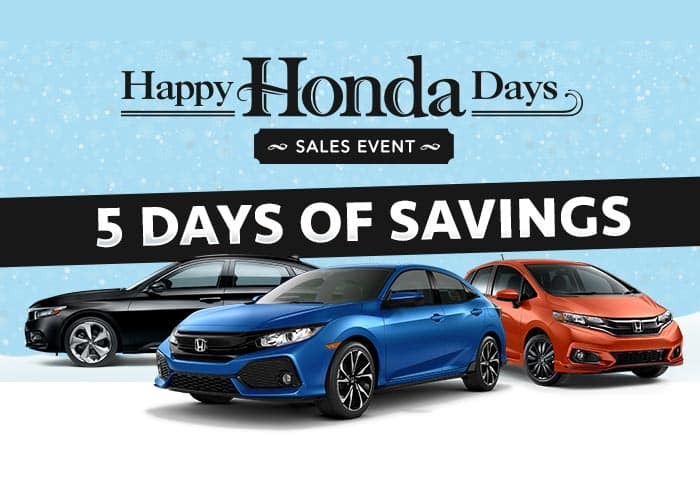 Take advantage of these great offers all month long during Happy Honda Days. *2018 Honda Accord LX Automatic. Stock# Y2323. 36 month 36,000 mile lease. Must take delivery out of dealer stock. Tax title and license fees and first payment due at signing. OAC. See dealer for complete details. See dealer for complete details. Expires 1/2/2019. *2018 Honda CR-V EX FWD Automatic. Stock# Y2396. 36 month 36,000 mile lease. Must take delivery out of dealer stock. Tax title and license fees and first payment due at signing. OAC. See dealer for complete details. See dealer for complete details. Expires 1/2/2019. *2019 Honda Pilot LX AT Stock# Z1112 or Z1135. 36 month 36,000 mile lease. Must take delivery out of dealer stock. Tax title and license fees and first payment due at signing. OAC. See dealer for complete details. See dealer for complete details. Expires 1/2/2019.